I was invited to be part of a panel in the Avon Rí in Blessington last week along with Marc Ó Sé, Anthony Daly, Dessie Dolan and Mick Galwey. Sporting tales recounted on high stools, and for two and half hours the audience hung on every word, testament to the passion for GAA in that part of the country. The event was organised by Renault through my friend Paddy Magee, a good Blessington and Wicklow GAA man, and afterwards, as we chatted to the locals, I got a sense of how disappointed they were that Dublin aren’t coming to Aughrim this Sunday. Let’s be blunt about this. Wicklow have been let down here by the GAA. 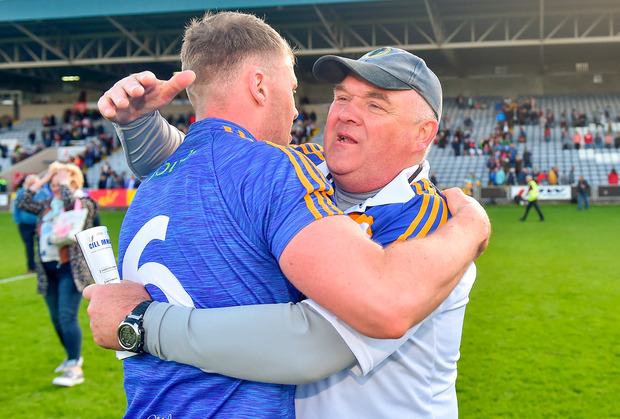 For Wicklow GAA people, this moment in the spotlight is rare and it’s wonderful but it feels like the reward for beating Offaly has been unjustly confiscated. Imagine not winning a Championship match for five years, then finishing bottom of Division 4, but going on and beating Offaly in the first round of Leinster. Imagine then the victory setting up a first Championship match with Dublin in 28 years at a time when they have footballers who will go down alongside some of the sport’s all-time greats. And then imagine not getting the chance to host them in your own county because the ground isn’t big enough to fit all the supporters. Particularly when Offaly had already been afforded that right had they won. It’s a missed opportunity for everybody involved. Aughrim is one of those few remaining GAA grounds with a bit of folklore about it. It’s not built in the middle of a town or next to a shopping centre. There’s no multi-storey car park and I’m sure the wifi isn’t great either. I don’t know whether it spooked St Vincent’s last November when they went down as Dublin and Leinster club champions but something clearly knocked them off their stride. In Mick O’Dwyer’s time in Wicklow, their last real patch of relative success, the place almost became a cliché. Aughrim – tough place to go. And it is. When you get off the motorway at Rathnew, the road thins and there’s the sense of going into the unknown. There’s a bit of magic about Aughrim. Even for the Dublin players, the decision not to play the match in Aughrim is a missed chance. These players have experienced basically everything there is to experience as inter-county footballers. They’re All-Ireland winners, Footballers of the Year, All Stars, Sigerson winners, Ireland internationals and all the rest. But this would have been something different. A tight, unfamiliar ground. A partisan, hostile crowd. They’re the conditions that make for unique and memorable occasions. Would it make any difference to the result? Would some Dublin supporters have been discommoded? Probably. But that shouldn’t be the deciding factor. Listen, the early stages of the provincial Championship are boring enough as it is, particularly in Leinster. The GAA need to at least create the conditions where surprises are more likely to happen. And sending Wicklow back to Portlaoise to play the Dubs is forcing them to concede the only advantage they would have had. Now? The game has little or no significance. Dublin won’t bat an eyelid going to O’Moore Park. They’ll have their routines, their processes and they’ll win at their ease. That might have happened anyway in Aughrim but now, even neutrals have been deprived of seeing the team of their era play in one of the GAA’s storied grounds. And I’m sure John Evans would have relished it. We played his Tipperary team in a qualifier game in Croke Park in 2010 after Meath had walloped us in Leinster. We were fairly unsteady on our feet at the time. Afterwards, Evans came in to our dressing-room and delivered some genuine words of encouragement at a time when we weren’t quite sure which direction we were heading. I distinctly remember him saying to us ‘Gilroy’s going down the right road, lads’. He repeated it three or four times over the course of his speech and each time he said it, he banged his fist off the wall, driving home his message. Other than that, I don’t know John but he strikes me as the type of manager who can galvanise players, the sort that fellas buy into his energy and ultimately, would crack a brick with their heads for. He took Tipperary to two promotions. The same with Roscommon. Is he unlucky not to have got a go at the Kerry job at some stage? Maybe that’s because he is that larger-than-life sort of manager, one of those energetic, outspoken sort of characters that used to manage inter-county hurling teams in the nineties. Maybe he’s a bit too brash. Maybe he doesn’t keep his powder dry enough, the way Jim Gavin or Éamonn Fitzmaurice do. Nowhere in the world is the ability to conceal one’s true thoughts valued as highly as in Kerry, so maybe that’s why Evans isn’t fully appreciated in his own land. But regardless of his methods, Evans’ managerial record speaks glowingly of itself. And bringing a county to their first Championship win in five years in his first season is no mean feat. It’s just a shame it wasn’t rewarded with the home fixture it deserved.